There are a number of tools in the world: wrenches and sockets and drills and watchacall’ems. There may even be more tools than there are people in the world to use them, especially when you factor in the fact that a number of the world’s seven billion people also happen to be tools. I don’t say this as a compliment to humanity, implying that we are a useful, helpful species. I’m simply arguing that there are people who closely resemble a brainless scrap of metal that does the bidding of anyone who happens to pick it out of the toolbox. Now, on most days, if you asked me where you could find one of these tools, I’d suggest consulting the friendly staff at your neighborhood hardware store. Or make a quip about congress or the Tea Party. But this week, if you came to me and asked, “Hey Shred, any idea where I can find a really blunt tool?” I’d probably have to direct you to the sheriff’s office. I recognize that the sheriff’s office has been largely off my radar since former Sheriff Pat Hedges—one of the most Shreddable men I’ve ever had the pleasure of disfiguring in print—flew the sheriff’s coop. Then the county had to go and elect Ian Parkinson, who seemed all dependable and rational and integritous. What? Shakespeare could make up words but Shredder can’t? They’ll be teaching this column in college English classes in a century or two. Mark my words. I knew the squeaky clean good guy image couldn’t last. And thankfully I was right. According to some little birdies who dive bomb me on my walk to work, Parkinson’s gearing up for the 2014 election. And his not-so-subtle campaigning leaves something to be desired. Namely class. But also the aforementioned rationality, which seems to have gone right out the window. We can all be tools from time to time. But anyone who allows the Tea Partiers—that’s right, the “if they come for your guns, blather nonsense at ’em until they’re so exhausted and confused that they agree to leave you alone” clan—to use them for their “damn guv’mint takin’ my moneys and my guns” agenda might just be an even bigger tool than Hedges. In short, Sheriff Parkinson’s getting a little too big for his britches and confusing his role as an enforcer of the law with someone who creates or interprets it. Apparently Parkinson skipped the entire semester of sixth grade in which we learned that there are other branches of government for that. Of course, Parkinson’s letter is so vague it’s unclear what gun control legislation he’s addressing, if the legislation in question even exists. I suspect that all the Tea Party’s talk about Parkinson being the highest elected law enforcement official in SLO County has gone to his head, especially given the fact that he’s addressing the right-hand man of the highest elected official in the country. Parkinson got, what, 18,000 votes? But really, use those votes as an excuse to tell the guy who got 66 million votes how to do his job. You don’t sound like a rube who’s been duped by a pseudo-political party at all. Way to cut off your nose to spite your deputies. Because some of the people most adversely effected by yahoos running around with military-styled assault rifles? That’s right, Parkinson, your own law enforcement deputies. But I totally respect your decision to put your deputies at risk to appeal to the only group of people who still think Sarah Palin would have made an awesome vice president. And the fact that the North County Tea Party is holding self-congratulatory rallies in which they brag that they’re leading Parkinson around by the nose—and be grateful I chose that appendage—doesn’t encourage much confidence in Sheriff I’ll-Enforce-the-Laws-I-Like. But apparently the support of the North County Tea Party was just the start of the campaign for Parkinson, who held the Sheriff Department’s first ever K9 memorial on March 14. Which is a brilliant idea because just about the only thing people in this country can agree on is the fact that dogs are awesome. They embody all that is innocent and good in this world. So what could I possibly have against a memorial service for a cute dog named Jake who served the county faithfully? For starters, Jake died three years ago. While I’m not an expert on funeral etiquette, the appropriate time to honor the dog’s life and years of service would have been in the weeks following his death. And while it’s true that most of the sheriff’s deputies probably don’t have a line boasting about their party-planning skills on their résumés, I highly doubt they’ve been working on the shindig in Jake’s honor these past three years but had a hard time with scheduling because all his buddies were busy at fetch camp. Maybe it was the construction of a “final resting place” behind the sheriff’s office that delayed the service, but considering the fact that most kids manage to bury their pets in less than a day, it’s not much of an excuse. I understand that over the course of the election, a candidate might find him or herself using family, friends, teeth whitening, and strangers’ babies to make a case for themselves, but a dead dog is and always will be off-limits as a campaign tool. And if our sheriff wants to maintain his credibility with the public, he should probably start sending the Tea Party the message that he’s off-limits as a tool as well. Shredder’s got watchacall’ems coming out the wazoo. 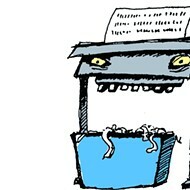 Send thingamajigs to shredder@newtimesslo.com.